Poverty is a major problem in the world. Fifteen million people die of starvation every year and six million of these are children. Instead of the vague teaching on prosperity, the Church must find practical ways of dealing with poverty in the church and the society as a whole. It is not enough to say heaven is the home of believers – life on earth must be fulfilling. Isaiah challenged the people of Israel to incorporate assistance to the poor and needy in their religious practices like fasting and prayer. While we pray for divine intervention, we must execute human intervention (Isaiah 58:6-7). 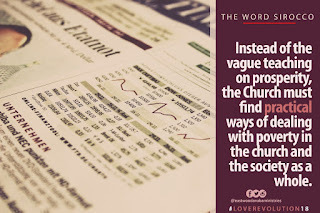 Jesus Christ compared the proactive nature of the world with the indifferent attitude of the Church by saying the former was wiser than the latter. The world does not defer peace, joy, comfort and sound health to the life hereafter. The Church on the other hand, absolves itself from responsibility by insisting that humanitarian assistance to people is a worldly activity (Luke 16:7-8). Giving food to the hungry, shelter to the homeless and clothing the naked is part of pure religion. It is sad that in many churches even the poor among them are neglected. Building people-focused ministries that prioritise the interest of worshippers and their wellbeing is an effective way of establishing viable and strong churches. 1. Pray that God will endow you with creative wisdom and ideas to enhance the economic state of your society. 2. Pray also for your church that it will be a tool by which God will eradicate poverty from the society.